I thoroughly enjoyed this journey back in time! 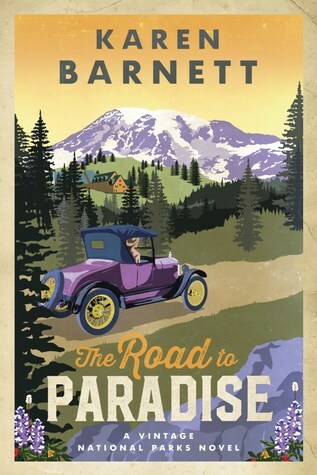 The beauty of the setting shines through the narrative, as Barnett treats readers to a realistic rendering of Mount Rainier National Park. I loved the artistic detailing of the flora and fauna and easily imagined them as I read. Margie and Ford are charming characters who share a passion for nature and preservation, and their story is a unique and refreshing read. I look forward to more vintage national park visits as this delightful series continues! In 1927, Margie Lane, an avid naturalist, convinces her Senator father to procure her a position at the fledgling Mount Rainier National Park. Since Ranger Ford Brannon lost his father in a climbing accident, he doubts his ability to protect the park and its many visitors. He certainly doesn’t relish the job of watching over an idealistic and privileged young woman with no practical survival skills. When Margie’s former fiance sets his mind on developing the Paradise Inn and its surroundings into a tourist playground, Margie and Ford will have to work together to preserve the beauty and simplicity of this mountain hideaway, but the developer’s plans might put more than just the park in danger.